CivRadio - The Great Pyramid of Giza has found its way into the center of a recent scandal involving six Egyptians, three German tourists, two Egyptian authority figures, one puzzled author and Partridge in a Pear Tree, or rather a Cartouche in a King's Chamber. rt.com - NASA’s Mars rover, the Curiosity, which has been exploring the planet for over two years, fitted with 17 cameras, sent a picture of something that looks much like Earth's traffic lights. examiner.com - One of Mars rovers photographed what appears to be a stone statue of an elongated head on the Martian surface which, surprisingly, NASA had identified as an anomaly of interest. 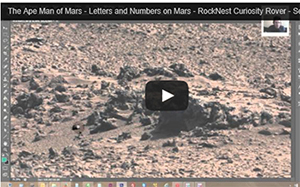 In a post released today on UFO Sightings Daily, Scott Waring described the stone anomaly as a “Face on Mars.” NASA had pointed out the apparent head statue along with other stone anomalies with different color arrows. AFP - Armed with laser rangefinders, GPS technology and remote control robots, a group of speleologists is completing the first ever mapping of the aqueducts of ancient Rome on archaeology's "final frontier". They abseil down access wells and clamber through crevices to access the 11 aqueducts that supplied Rome, which still run for hundreds of kilometres (miles) underground and along stunning viaducts. Cracked | Since not all of us decided to tell our parents we'd be moving back home in four years by majoring in classics, much of what we know about ancient Greece and Rome tends to come from films and TV -- meaning that much of what we "know" originated with some Hollywood producer saying, "Yes, but can we make the togas sexier?"